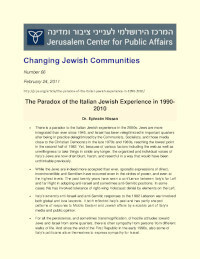 There is a paradox to the Italian Jewish experience in the 2000s. Jews are more integrated than ever since 1945, While the Jews are indeed more accepted than ever, sporadic expressions of direct, incontrovertible anti-Semitism have occurred even in the circles of power, and even at the highest levels. For all the persistence, and sometimes transmogrification, of hostile attitudes toward Jews and Israel from some quarters, there is often sympathy from persons from different walks of life. And since the end of the First Republic in the early 1990s, also some of Italy's politicians allow themselves to express sympathy for Israel.